I login. Tons of afk-outs for the raid. Okay so a night off. I do all my dailies. Like okay only 15 dailies, but that's tons when I'm not doing any ones for reputation anymore. Did my food daily. Did all the tournement dailies. I'm in LFG for an Ulduar run as I'm not locked and not likely to do a raid until next Tuesday. I get an invite from someone I know. Turns out it's for Naxx. They're on Thaddius and rebuilding a raid. People that join PUGs often see that. Thaddius is where people just coasting end up tearing down a raid. Endlessly. Well, there were a couple guildies there too and we one-shotted him. Even with TWO people not grouped up at all and healing from the upper terrace that you jump from. It turns out they only have one wing left to clear. We march down to Razuvious get him to 30% health and the priests can't manage to MC. No +hit I'm thinking. They also don't seem to put up the armor buff before taunting. Well, then the raid folds. So one boss. Okay. Port back to Dalaran. See an OS-25 in /General. Okay. Sure. Bing bang boom. Done. No, still no trinket for me. 'sawlright. Wintergrasp starts in 30 seconds after OS-25. Fly over and parachute in on their walls. Sniper a few victims and take out two guns. Stay inside fighting with Beast Aspect on to at least not draw in hunters to me. Scurried over to the RPGs. Grab one of theirs and then hop in the back inside operator room of the Goblin tank shop. Fire off 5 RPG rounds. It seemed to maybe sorta have an effect. The most noticable effect was three guys piled in and nuked me. Rez, get a tank and roll on in. Bing-bang-boom. Get in on a successful WG-25 run. Nice. Emulon down. Hurray. No, no loot. Okay. Everyone is running out. Hearth. Say thanks. Drop group. Get a whisper from a healer. "Umm. Archivon?" "Doh!" Whisper raid leader. Let raid beat me up. /Humble. Brain-fart. Get lock summoned back right before the pull. Get the 3rd damage spot with zero raid buffs. Hit up some PvP when I run (/sigh) out of the Vault. The daily is EotS. I give it a shot. I haven't been there in a while. Oh-noes! At the start it's 5 alliance vs 13 horde. I have Leader. I get killing blows on three guys trying to take mage tower. More alliance join. We have good call-outs. Good covers. Good movement. We keep two towers, threaten their two towers and consistently capture the flag. I was pretty happy and screenshotted the final tally. Bing-bang-boom. Turn it in for a reward. Hmm. 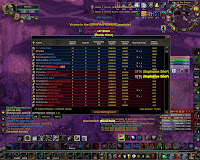 Looking it over, it appears the Warlock below me on the list got more honor than me because he health funneled his pet. Am I reading that right? Hmm. Back at Wintergrasp's vault. Join LFG for 10-man. Hop in a Strand BG. Try out the tank scaling with gear deal. My tank gets up to 81.6k or maybe it's 816k. I'm off by a factor of ten, but the basic I had seen before was 80 (err 800). So that's neat. I did tweak my gear using a new Outfitter set auto-optimized for high iLevel. Decent. I'll need to tweak it so it's always the PvP versions though. Get a whisper for what my dps is. Ah! The LFG channel. "10 man?" "Around 3.5k." Score. "How many people in, as I can't see raidframes while in my BG." Neat, still have five open slots so I get to finish up.